Thrash is a highly coveted strain of heavy metal. Its speed, groove, and gritty aggression are elements diehard fans hold dear and get very protective over when the progressive arm of metal sidles up to it. In some ways, death and black metal have been more accommodating as more and more bands emerge each year with so much new music. It was upon reviewing the latest album from Colorado thrashers Havok that I realised how strong the sentiments surrounding thrash really are. They have taken a somewhat progressive approach with Conformicide when comparing it with the likes of Time is Up and this could well bisect the fan base. 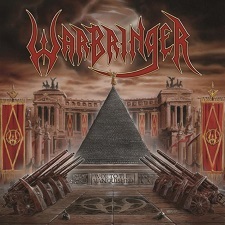 This all brings us to Los Angeles’ Warbringer and its fifth full-length studio album. There will inevitably be those bands which push the boat out and experiment and there will be those who stick fairly close to the path they started out on. The LA thrashers, in the context of today’s thrash metal scene, resemble the likes of Battlecross and that machinegun sound. Together with dominant themes of war, the sound is full and charged up with polished riffs and drilling drum blasts. Havok, on the other hand, made their impact with more of an old school sound which in turn is what has caused a divide amongst many fans with Conformicide. This is not to say that Warbringer is a progressive thrash outfit and deviating from an established school of the genre, but rather that it’s a band embedded within the modern mould. Woe to the Vanquished exhibits two new band members in Jessie Sanchez (bass) and Chase Becker (guitar) who join front-man and founding member John Kevill (vocals) and Adam Carroll (guitar). While they appear to gel well, there is something that fails to render these eight new tracks a complete package. The album’s first half is fairly strong. “Silhouettes” and the title track bleed into each other a bit with not a lot to distinguish between them other than a guitar solo on the latter. “Remain Violent” is probably the album’s standout moment – there is plenty of groove and attitude from Kevill with some gang vocals thrown in there to make it a rather memorable song. This is sure to be a favourite played live. “Shellfire” is very straight down the line and Kevill makes good use of the Tom Araya-like shrieks. There is some nifty guitar work from the duo of Becker and Carroll on “Descending Blade” to tie up this first half of the album as mentioned earlier before the rather misplaced “Spectral Asylum” kicks in. “Divinity of Flesh” is a last dash at some smart guitar solos as things close with the long-winded “When the Guns Fell Silent” – at just over eleven minutes there is not a lot here to warrant it. Warbringer is set to embark on a tour with Havok and it’s a thrash outfit to be reckoned with, but unfortunately on this fifth album the band has fallen a bit short.